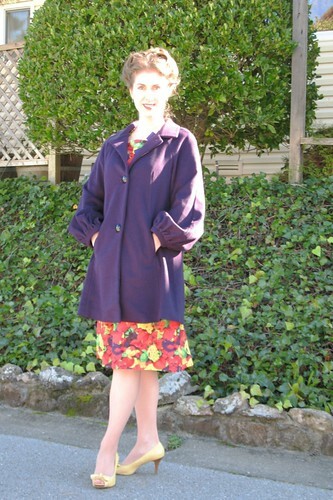 I'm shocked that I'm about to say this, because I'm in favor of adding peplums to everything (blouses, jackets, other people's children...) but I think I like this better without the peplum. 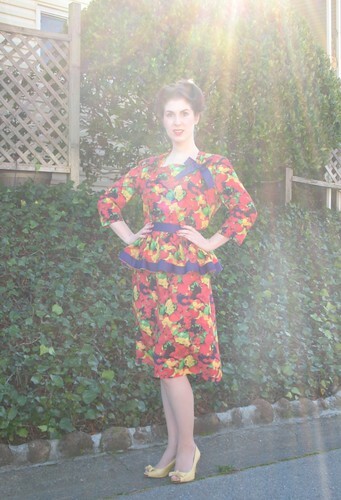 i love the dress, the fabric, and the peplum. 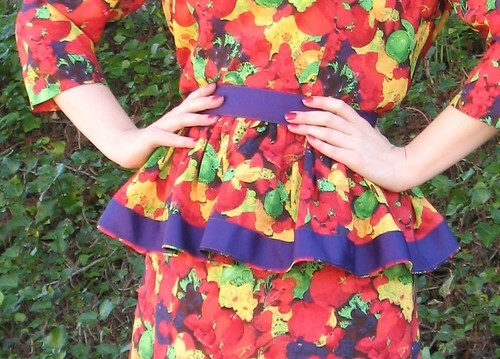 the ribbon edge of the peplum, not so much. you look beautiful, however. thanks for the post! I really hope you do add a Carmen Miranda hat/fascinator at some point. Love the version with the peplum. I think this really has to be one of the most elegantly sophisticated ways I've ever seen a fruit print put to work. 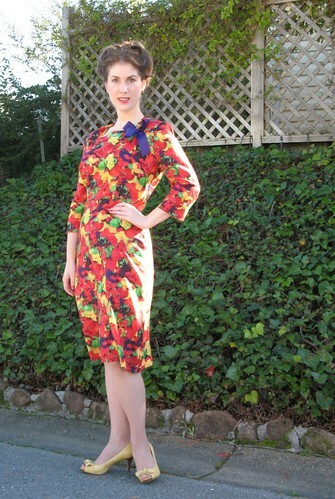 You went with the perfect dress pattern to help turn it into just being a cute print to one that suddenly seems wildly chic and like something that might have come down a designer runway. I stopped rolling my eyes when I noticed it was making my upper lids sag. I say ix-nay on the eplum-pay. The way I always see it is this: if the print is eye-catching, make the dress about the print and keep the lines simple. 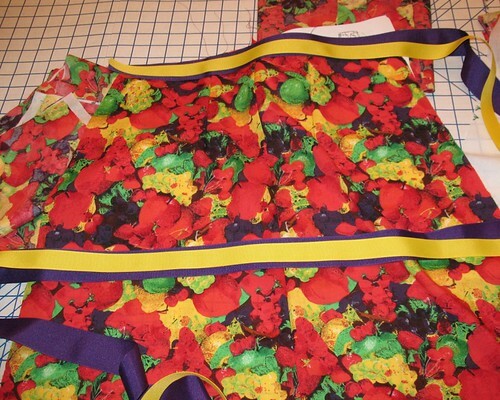 If you're sewing with a solid, make the dress about the lines. Doing both rarely works, imo. 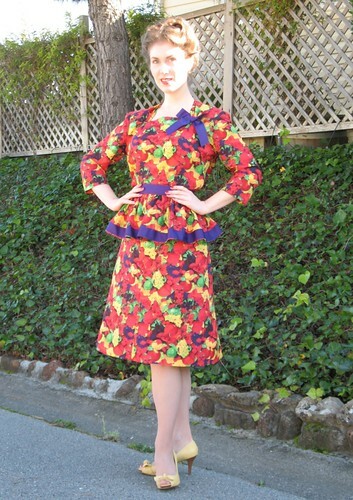 Your dress is smashing (I'd never have guessed the print was fruit) and the single purple bow works wonderfully. Great job! 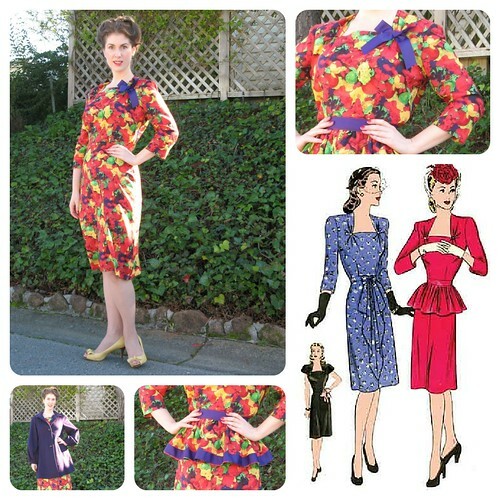 Removable peplum!? MIND BLOWN! And it is fabulous both ways! Fantastic! I would guess this was a FFC/Denver purchase - aren't they the best source of "surprises"? I have gotten some very unexpected textiles from them. You certainly overcame any disappointment. This dress is a triumph in every way. I would go without the peplum, but this is only because I just can't get on this peplum bandwagon, whether it is the current craze or the one in the 40s. I do love the purple ribbon though. Freakin fabulous! I LOVE this dress! It looks great both ways too!